"This team is probably more like the type of team that I thought I would have when I started here. We're probably guard-oriented to start, and I like our big guys, it's just that they have no experience. I think they're going to be alright. We had a tough blow the other day, we lost (sophomore center) Cori Johnson for the year. He got hurt, knee injury, and he was a big, strong kid. "I think we're going to play faster and try to get after people a little bit. We have a lot more guys that can make plays on the perimeter. In the past, we had Brent Jones or Yunus (Hopkinson), end of the shot clock off a ball screen. Glenn Sanabria, you know, his first year, now we have multiple guys. I think our guards can really score and make plays, and our big guys just got to get some experience and develop, and I think we have a chance to be okay as the season goes on." Rasheem Dunn led Thomas Jefferson High School to their first PSAL AA championship in 62 years and was named the Co-Most Valuable Player after scoring 23 points in the title game at Madison Square Garden. Jefferson also won the program's first state federation title last season. He averaged 16.0 points, 5.0 rebounds, and 4.0 assists last season. Gianni Ford went to Boys and Girls High School, where he averaged 18.8 points, 4.5 rebounds, and 4.1 assists in his senior year, and he averaged 25.0 points per game in the PSAL playoffs Ford is regarded as one of the top shooters in New York City, and he scored 21 points in the Unsigned Hype Senior Showcase at Westinghouse High School in Brooklyn. "They're talented kids, they're going to be really good," Braica said of Dunn and Ford. 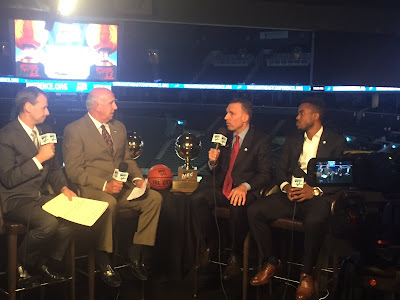 "You may see four guards or four point guards on the court at times for us a lot this year. Those guys are talented, they still don't know what we're doing, so they got a long way to go (he said laughing), again, they're guys that can make big plays like Yunus (Hopkinson) and Glenn (Sanabria). So, I think the more guys you have that can make plays, whether it be one-on-one or off the ball screen or in transition, the better team you're going to be. Those guys have a lot to learn, obviously freshmen, it's tougher. I tried to explain to them that it took Yunus a couple years to figure it out and now he's a terrific player. Glenn Sanabria, he didn't play his first five games of his college career, you know, he just wasn't ready, so you never know when it clicks. "I do think those guys are very talented, though, and they give us, you know, Gianni gives us another guy who can shoot the ball, and Rasheem is just a bull going to the basket, you know, it's something we haven't had. We haven't had a guy get to the rim like that, get to the free throw line from the perimeter. I think this year we're going to have to get a lot of our paint touches from drives, whereas in the past it was run something and get it inside, and I think now, it's gonna be a lot of our paint touches are going to be from the perimeter, and that's good, that's good." Josh Nurse, a native of Laurelton, had some big moments in his freshman season, as he had three rebounds in their victory against Mount St. Vincent, and had four points (all at the free throw line), five rebounds, a block, and a steal in a win against St. Francis (PA). For the season, he averaged 4.7 minutes, 0.3 points and 0.9 rebounds per game. Braica said of Nurse and which forwards it looks like he will rely on the most this season, "Josh (Nurse) has had a good preseason, he's a different player than he was last year. Last year, you know this time of year, he looked out of place and he really wasn't ready for this, but this year he looks like a player and he shows flashes of being very good. It's still going to be a learning process, so I don't want to put too much on him because he's an inexperienced guy, but he can run too. He's got all the tools; he's got great feet, great hands, he can pass the ball, and he's got a nice little post game he's developing. We just need him to hold down the fort and rebound and guard the post. He's got to play, we're throwing all those guys to the wolves and they just gotta respond. We've got some guards who are tested; we don't have any big guys who are tested." St. Francis has a freshman forward, Robert Montgomery, who produced 13.2 points, 10.0 rebounds, and 1.5 blocks per game at Mount Zion Prep in Baltimore. Before that, the Montgomery Village, Maryland native went to Takoma Academy, where he averaged 10.7 points, 9.1 rebounds, and 2.4 blocks as a senior. Out of more than 25 male teams from across the country, Montgomery helped his team win the SWAU Annual Tournament in Texas and was named the Most Outstanding Player of the event. Braica said of Montgomery, "He's an undersized big, a little like Jalen Cannon. I'm not saying he's as good as Jalen, but he's in that mold that he's undersized. He rebounds, played pretty well the other day when we brought refs in and he's very explosive. I think he has a chance to be a good player, as does the kid Jahmel Bodrick as well." St. Francis opens the season at North Carolina State on November 13, the first of six on the road before their home opener on Monday, December 5 against Lafayette.